When my daughter was just three years old she needed to start wearing a patch to help with her vision problems, and boy did she hate it. The very first thing they tell you is that you can pick up some adhesive patches at any drug store, and so we did. Within a few days my poor girls eye was getting a rash, and the adhesive was peeling her tender skin off. It was miserable. 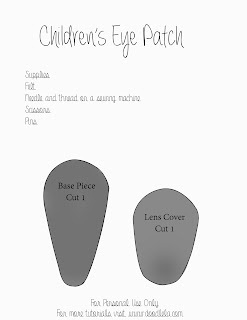 Let me help you save your child the same misery by showing you how to make a simple patch your child will not mind wearing so much! You can print out the pattern for the patch by clicking the picture link below. For this tutorial I'm going to use this Hello Kitty patch because it's easy to see where I've attached pieces. If you get further along and need some help feel free to contact me or leave a comment below. 1. Print out your pattern pieces and cut them out. Turn the patch pieces to the direction of the eye you need to cover. This is so important! You don't want to make a patch for the wrong eye! 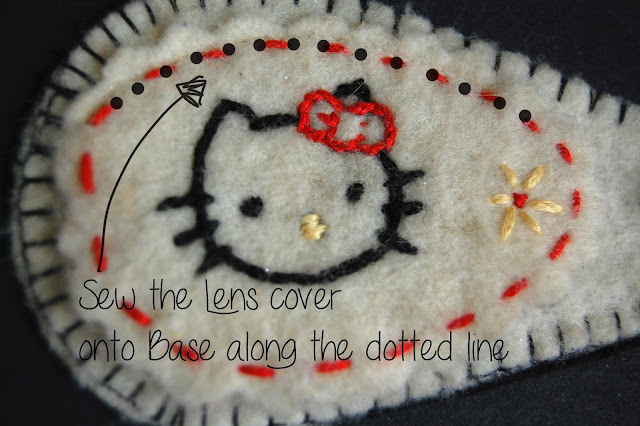 Use the pattern to trace the shapes onto your choice of felt. I used a fabric marker to then trace on the pattern for embroidering. Embroidering your patch is purely for the kids pleasure. My daughter got a kick out of having something cute and girly and made it more desirable for her to wear it. Choose whatever character or design you/your child would like. 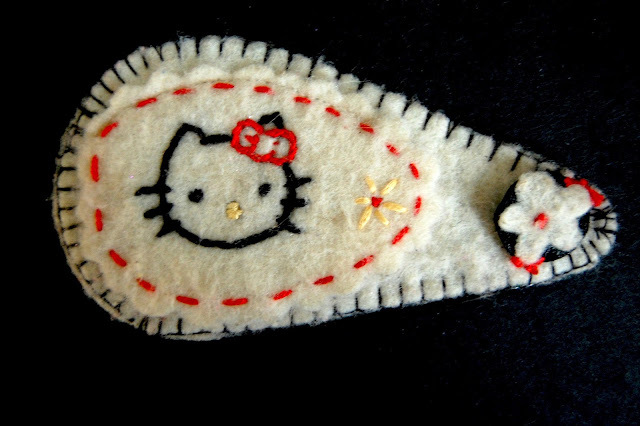 For Hello Kitty, I backed the Base Piece with a very thin piece of black leather that I had some scraps of. It helps to block light/vision and is still light enough to not weigh down the glasses. I suppose you could also use a darker color for the Base Piece. 2. 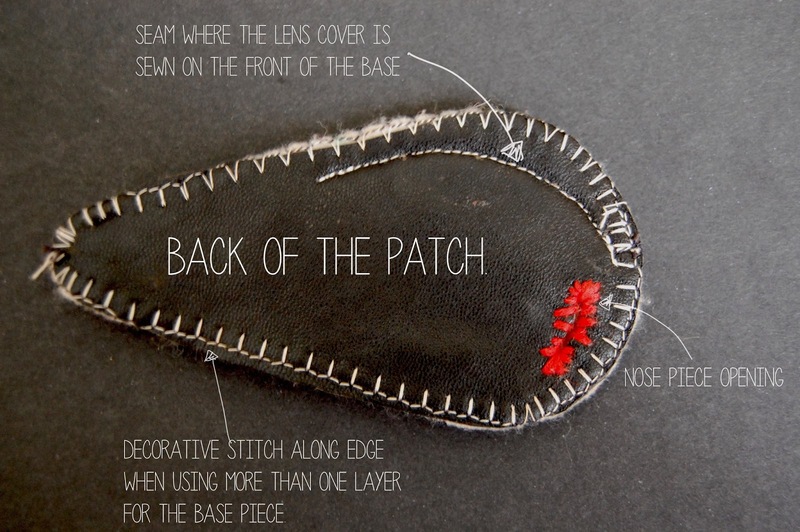 Around the edge of your Base piece use a zig-zag stitch, or other stitch that might hold the edges of your felt together, so that with time and wear it won't start to fray apart or pill. You can see this in the pictures around the edge. Mark this spot on the base and carefully cut a hole big enough for the nose piece to fit comfortably through. 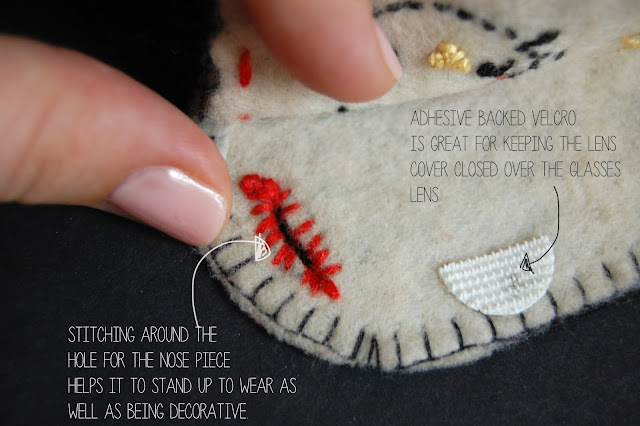 Hand stitching around the edge of the nose piece hole has several benefits--it will hold double layers together if you use a darker backing like I did, it is cute and decorative, and it will help hold up to wear over time. This patch is about 4 years old...it's held up well! 4. It's time to make the piece that will hold the patch along the ear piece of the glasses. With several of the other patches that I've made I simply stitch a small piece of elastic onto the back end of the patch. I sewed one end to the top edge, and the other to the bottom edge so that the ear piece could slip through it. With this particular patch I cut out a little flower, sewed it to a piece of black felt and attach the top and bottom so that her glasses ear piece slid through. 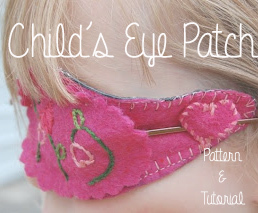 It's important to add some sort of ear piece holder to the end of the patch so that it doesn't sag and let light in or tempt your child to peek out the side with his/her "good" eye. 5. Now that each piece is complete all you need to do is attach the lens cover to the base piece by sewing along the top edge. You want to be sure to sew about the nose rest hole so! See picture below. Trim loose threads! On the underside of the edges of the patch I put some small pieces of adhesive backed velcro to hold the lens cover against the base when the patch is on the glasses. Without the velcro it does stay attached, but the lens piece may stick out a bit. See the picture above step 4 to view this. Try it on your little one and see how it fits. If you feel you need help, please don't hesitate to let me know! Thank you for posting this :) I'm having a really hard time convincing my little to cover her eye every day. Maybe this will help.